Author(s): Zhou Chen, Aili Zhang, Zhaogang Yang, Xinmei Wang, Lingqian Chang, Zhaofeng Chen, College of Material Science and technology, Nanjing University of Aeronautics and Astronautics, Nanjing 210016, China and Chemical and Biomolecular Engineering, The Ohio State University, Columbus, Ohio, 43210, United States. Ly James Lee. College of Material Science and technology, Nanjing University of Aeronautics and Astronautics, Nanjing 210016, China and Chemical and Biomolecular Engineering, The Ohio State University, Columbus, Ohio, 43210, United States. With the development of nanotechnology, nano-biomaterials have shown good development prospects in gene therapy. Cationic lipids include a group of amphiphiles that exhibit positive charge which interacts with negatively charged DNA/RNA leading to the formation of complexes containing condensed gene materials. Cationic liposomes complexed with gene materials are promising non-viral carriers for gene therapy. As an environmentally ionized cationic lipid, N-[1-(2,3-dioleyloxy)propyl]-N,N,N-trimethylammonium chloride (DOTMA) shows positive charge at low pH with moderate pKa value due to the headgroup of tertiary amine. It makes 1,2-dioleyloxy-N,N-dimethyl-3- aminopropane (DODMA) very effective in encapsulating nucleic acids during synthesis by temporarily reducing pH. Thus, lipid nanoparticles with DODMA can have neutral or low zeta potential at physiological pH. These remarkable structure-dependent properties have far reaching application potential in gene therapy. This review summarizes the synthesis methods and structure characteristics of DODMA and derivatives, and illustrates their applications in gene delivery. Keywords: DODMA, cationic lipid, liposome, gene delivery. Affiliation:College of Material Science and technology, Nanjing University of Aeronautics and Astronautics, Nanjing 210016, China and Chemical and Biomolecular Engineering, The Ohio State University, Columbus, Ohio, 43210, United States., College of Material Science and technology, Nanjing University of Aeronautics and Astronautics, Nanjing 210016, China and Chemical and Biomolecular Engineering, The Ohio State University, Columbus, Ohio, 43210, United States. Keywords:DODMA, cationic lipid, liposome, gene delivery. Abstract:With the development of nanotechnology, nano-biomaterials have shown good development prospects in gene therapy. Cationic lipids include a group of amphiphiles that exhibit positive charge which interacts with negatively charged DNA/RNA leading to the formation of complexes containing condensed gene materials. Cationic liposomes complexed with gene materials are promising non-viral carriers for gene therapy. As an environmentally ionized cationic lipid, N-[1-(2,3-dioleyloxy)propyl]-N,N,N-trimethylammonium chloride (DOTMA) shows positive charge at low pH with moderate pKa value due to the headgroup of tertiary amine. It makes 1,2-dioleyloxy-N,N-dimethyl-3- aminopropane (DODMA) very effective in encapsulating nucleic acids during synthesis by temporarily reducing pH. Thus, lipid nanoparticles with DODMA can have neutral or low zeta potential at physiological pH. These remarkable structure-dependent properties have far reaching application potential in gene therapy. 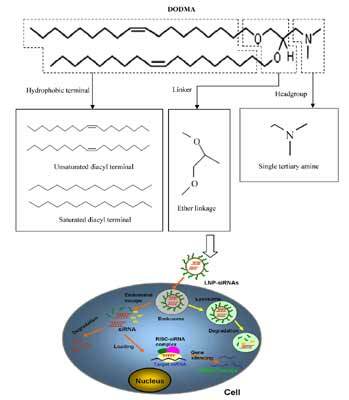 This review summarizes the synthesis methods and structure characteristics of DODMA and derivatives, and illustrates their applications in gene delivery.